#1 Son takes our beagle, Molly, to the neighborhood reservoir almost daily. She loves it. She runs, she drinks from it, and at times, she rolls in it. When we moved into the neighborhood 8 years ago, it was just a huge hole in the ground. It’s taken quite a while, but the reservoir now sits calmly in our backyard and offers water to our county and others from its surplus. I have to confess that for a season I have not been a canal nor a reservoir, but simply wading in the kiddie pool of God’s grace. Although faithful to reading, praying, playing, serving, and worshipping, there has been no surplus. To be honest, it hasn’t been enough to get above my ankles. 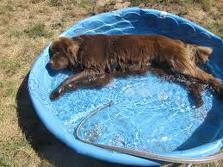 In my blue, plastic, kiddie pool, its typically taken the edge off the heat of life and that’s not abundant living. I’ve only been stepping in, walking around a bit, and stepping out. Today, the kiddie pool is set aside. I’ve been jumping into the deep end of the pool of God’s grace daily and there is a surplus of joy to be shared. During the month of January, I have had the time of my life reading only that which is honoring, helpful, and funny. I have eaten only that which is shared with those who love me deeply or make me laugh my head off. I have been reading the New Testament from a Kindle without notes (which really means “without expectations”). I have joined others who fearlessly wear the banner of “Jesus Freak” as we have learned new things through conferences, seminars, books, and podcasts. I have guarded the walls and stopped the leaking. I am so grateful for this season of filling. Lynne is a published author, speaker, and coach. She co-led a Saturday workshop with the beautiful Carol based on Laurie Beth Jones’ book “The Path: Creating Your Mission Statement For Work And For Life.” I and a precious girlfriend/bridesmaid joined 14 other wonderful women with the goal of discovering a true filter, a personal mission statement for our individual lives. Anyway, one item I had listed was to “attend a learning opportunity, at least monthly, with a girlfriend with whom I can laugh my head off.” Being the overachiever I can’t seem to shake, January has been filled with several of these learning opportunities. CPC with Kate, Diane, Lauren, Lisa, and Pat (Nate was there, a cool dude, indeed) was learning-overload and filled my brain and heart that still has me reeling from early January. I returned with a burden for a more intentional presence of a conference-wide priority for reclaiming the professionalism of those who serve in Children’s & Family Ministry. Momentum is beginning and the stage is prayerfully being set . . . aka: I’m talking about it all the time with whomever will listen. A path was set before me at a conference called QUEST 6 years ago that changed my life. I want to help prepare a similar path for those who are coming up behind me. Will post more about this another day. Yep, I’ll be sharing 2011 with the bridesmaids of my life and we’ll be going to the fields to be lovely. Got your bridesmaids of life? Invite them to go to the fields to be lovely with you. A lovely colleague asked me “Why Children’s Pastors Conference?” With all the other seminars, conferences, training events, etc. that are now available to professional Christian Educators, why did we tread through the snow and ice storm of the southeast, driving on the one clear lane through Atlanta, to attend CPC 2011 in Orlando? Lauren from Wesley Chapel responded, “because of the music and the level of excellent speakers. . . oh, and the free stuff I can use as soon as I get back home.” Diane from Mt. Bethel shared, “the inspiration and refreshment to stay up with the upcoming changes in children’s ministry, the church, and the culture. This year, it affirmed that our ministry team is right on target.” These devout Jesus freaks for kids are so right. For a group of people who dedicate their lives and vocations to being the church on a shoestring, who barter vbs material, who share and borrow, whose offices look like storage sheds with overhead lights, and have a never-ending supply of goldfish . . . CPC treats you like the princes and princesses of the kingdom that you are. We are trusted with the latest research material on how to reach our “congregations,” trusted with access to publishing companies that invite you to play with vbs prototypes, and honored with the highest level of excellence in teaching, speaking, and encouragement. Having said all that, the reason I choose CPC is . . . I am a better, more confident servant for Christ when I come home. Yep, after a day set aside to sleep and give my brain and body a rest, I am ready to take on the world. It usually takes me a day to connect with all the folks I met and the workshop leaders who graciously let me into their worlds. And it usually takes me a month to go through the box of goodies, tools, books, toys, and breakout notes. I am reminded of my mission to “know God and make Him known.” The consistency of excellence calls us to make plans to return every year . . . along with the generosity of those who believe in His calling upon my life. If ever two words belonged together, it’d be these two: Preschool Worship. Little people just naturally desire to dance before the LORD, assume the many positions of prayer, and respond with freedom and transparency. Today, I have the honor of sharing a workshop for the North Georgia UMC Conference at Snellville UMC. Anytime I can toot the horn of Jesus for the sake of little people, I am thrilled. THEN, I wake up early this morning and flip the page on my Transformation Journal devotional and find the topic for this week to be “worship.” Cool! John 4:1-26 speaks of the unnamed Samaritan woman at the well where Jesus has His longest conversation outlined in the scriptures. Jesus lays it out for her that “the true worshipers will worship the Father in spirit and truth, for they are the kind of worshipers the Father seeks.” (vs 23) Sounds like freedom in worship is the goal. Freedom for my human heart to respond to and connect with the heart of God. Freedom to seek God in an honest and intimate way – not just the external demonstrations, not just the music, not just the offering, not just the order. Reminds me of David. Although David sometimes failed God with disobedient behavior, he clearly expressed his love for God with utter delight and joyful abandonment. Now we’re talking . . . sounds like a preschooler . . . sounds like me. Now, I have to admit that although I am a fan, I may not know each player’s name, where they came from, even which team they are playing (Bob now puts this on the fridge for me in August). But I am loyal to the max. I shared a season on land and in buildings with other LSU-Baton Rouge campus students that changed our futures. It reminds me of the local church. I am also a fanatic for the local church. We come in as individuals with expectations and hope, then we begin to share a season on land and in buildings that will set us on a course of changing our lives and making a difference in the world. May I put on my purple and gold AND the love of my local church enough to invite others to jump on board. We are supposed to be a team, right?